HOUSTON, TEXAS (AP)–Oakland’s offense went cold after the A’s jumped out to an early lead against Houston on Friday night. When they finally rediscovered it in the ninth inning, almost everybody got in on the action. Daric Barton and Josh Donaldson had two RBIs apiece in a seven-run ninth inning during which 12 A’s batted to help Oakland to a 12-5 win over the Astros. The game was tied at 5 when Josh Fields (0-2) plunked Brandon Moss before back-to-back singles by Alberto Callaspo and Craig Gentry loaded the bases. Barton’s sharply hit grounder bounced off Jose Altuve’s glove and into right field to send two home. Rookie right fielder George Springer’s error on that play allowed a third run to score, sending the few fans left filing to the exits. Donaldson, who homered twice on Thursday night, connected again on Friday with a shot off Anthony Bass to the Crawford Boxes in left field to make it 12-5. Moss was hit by a pitch for a second time in that inning after the home run to become the first player in the majors to be hit twice in the same inning since David DeJesus on June 18, 2012. Jed Lowrie had two hits and two RBIs to help the A’s improve to 5-0 against Houston this season and 25-5 against the Astros all-time. Altuve had three hits and drove in a run for Houston, which has lost 10 of its last 12 games and allowed 22 runs in the first two games of this four-game series. Chris Carter hit a leadoff double in the eighth inning, but Luke Gregerson (1-1) retired the next three Astros to end the threat. Former Astro Fernando Abad hit Jason Castro on the backside with a pitch with one out in the ninth inning. Castro jawed with catcher Derek Norris before heading to first base. Houston manager Bo Porter darted out of the dugout and began yelling at plate umpire Jordan Baker and was ejected. 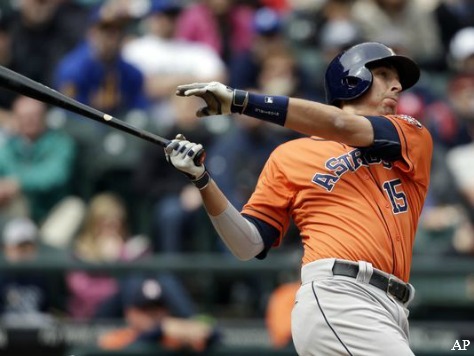 Castro’s plunking came after Lowrie accused Houston of intentionally hitting him with a pitch Thursday night for an incident in the last series between these teams when the Astros were miffed after he attempted a bunt with a seven-run lead in the first inning. Moss didn’t think he was hit on purpose, but he parroted what Porter said a night before when Lowrie was hit. The A’s put up four runs in the second inning and extended the lead to 5-1 in the fourth. Houston answered with four runs in the bottom of the inning to tie it up. Jesse Chavez had his first tough outing of the season, allowing a career-high eight hits with five runs — four earned — in five innings. He entered having allowed just one earned run in each of his four starts and had a 1.38 ERA. Houston starter Brad Peacock yielded five hits and five runs, including three earned, with a career-most six walks in five innings.